Higgins visited a local community centre to see if we could get the community involved in our hoarding project. When visiting we quickly learnt that there was a very active over 55s art class that took place each week, these were ladies who had retired and have lived in the local area since they were children. None of the ladies are professional artists: they attended as they enjoyed learning how to draw and paint, and also socialising with the other members of the art class. Higgins thought they would be the perfect people to get involved with the project and it was down to them to come up with a theme for the artwork. We had explained to them what was being built and also what was there previously and findings we have discovered on site. Members of the art class were quick to learn there used to be a hospital located where we are currently building over 60 years ago. The art class therefore decided to go with the theme of ‘History’. Higgins provided the art class with materials used to complete the art project, the ladies kept to a black and white chalk and charcoal theme and drew things such as nurses, horses and carriages, children toys and jewellery. Once the ladies had finished their project we took the work away to have them waterproofed and installed on the hoarding. 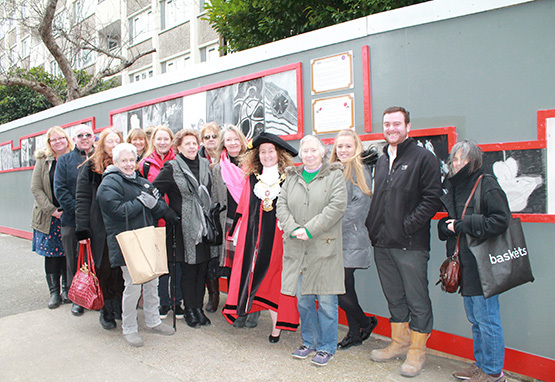 We held an art reveal day for all the ladies that took part and even had a visit from the Islington Mayor. The ladies loved seeing their work up on the hoarding for everyone to view, and were very thankful for getting them involved and enjoyed reminiscing on the history of their local area.